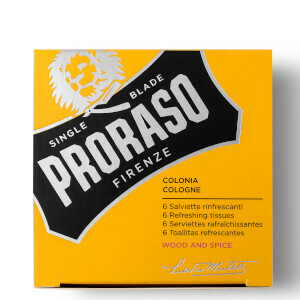 Instantly invigorate the skin with Proraso Refreshing Tissues in Wood and Spice. Helping to cool and calm the complexion, the cologne wipes use notes of Rose, Cumin and Vanilla to delicately infuse the skin and uplift the senses. Simply dab the beard or face for instant refreshment. Alcohol Denat., Aqua (Water/Eau), Parfum (Fragrance), Alpha-Isomethyl Ionone, Coumarin.